Discover how to Think Like an Ecosystem during our three-day training that cross pollinates the fields of biomimicry and social innovation. Through exploration of an old growth forest inside the New York Botanical Gardens and a field trip to the shorelines of the City’s largest park, you’ll explore lessons from nature and learn how to apply this ecosystem intelligence to organizations and social innovation efforts.Have a specific opportunity or challenge you’d like to address? The Design Workshop is a two-day extension for those ready to roll up their sleeves and begin applying the concepts learned during the training to a specific issue or opportunity. Through direct coaching with our expert instructors and collaborative engagement with fellow learners, you’ll work to unpack the most applicable lessons from nature, then apply them systematically to your challenge. The Think Like an Ecosystem training is a prerequisite for this extension unless you’ve previously taken a Biomimicry Social Innovation workshop with Biomimicry 3.8. Each day will be brimming with content—you should plan to clear your agenda and fully immerse yourself in the biomimicry experience! You will gain new insights and new ways to unpack challenges as you explore how to apply nature’s lessons through experiential play with lessons from local ecosystems. From a homebase of the New York Botanical Gardens, workshop activities will vary from lecture time to hands on activities to fields trips that explore Pelham Bay Park, New York City’s largest park. This will be an active and fully engaged workshop, so come ready to dive in! Dr. Dayna Baumeister is a world-renowned biomimicry lecturer and consultant, as well as the Director of the Biomimicry Professional Certificate Program and Co-director of The Biomimicry Center at ASU. With a background in biology, a devotion to applied natural history, and a passion for sharing the wonders of nature with others, Dayna has worked in the field of biomimicry with business partner Janine Benyus since 1998 as a business catalyst, educator, researcher, and design consultant. As a workshop leader, she will share her 18+ years of experience bringing biological intelligence to a wide range of audiences as well as her visionary leadership for the meme. Toby Herzlich is a leadership trainer, master facilitator, certified Biomimicry Specialist, and the founder of Biomimicry for Social Innovation. Toby is committed to the creation of a just, healthy, and regenerative society, and heartfully enthused about the transformative potential of applying nature’s wisdom to humanity’s sustainability aspirations. With more than 25 years of facilitation experience, she is a Senior Trainer with the Rockwood Leadership Institute, co-founder of Cultivating Women’s Leadership, and a consultant to organizations such as the Sierra Club and the AgroEcology Fund. She finds much of her purpose in catalyzing diverse networks of social change innovators, including the Young Climate Leaders, and intends to germinate a co-evolving network of leaders using nature’s intelligence as guidance and inspiration. Lisa Dokken holds one of the first Masters in Science in Biomimicry from Arizona State University and is a Certified Biomimicry Professional. Lisa lectures on biomimicry and nature based solutions at The Earth Institute, Columbia University, as well as Bard College’s MBA in Sustainability program. Prior to her diving head first into biomimicry, Lisa worked in sustainable development for the United Nations Development Programme and the Clinton Climate Initiative in Asia, Latin America and Africa. She is also on the board of directors for the BiomimicryNYC regional network. Price for attendance at the June 12-14, 3-day training is $1,950. Designed to be highly affordable and flexible, registration covers catered lunch each day, all activities, tuition, workshop materials, and administration costs. You will need to choose your own options for breakfast, dinner, and lodging based on your preferences. The June 15-16 Design Workshop extension is $1,500. Registration includes catered lunch each day, all activities, tuition, workshop materials, and administration costs. The Think Like an Ecosystem 3-day training is a prerequisite for this extension, unless you’ve previously taken a Biomimicry Social Innovation workshop with Biomimicry 3.8. You’ll see an option on the registration form to select the three-day training only, or the three-day plus two-day workshop extension. Attendees are responsible for covering the cost of transportation and lodging, as well as breakfast and evening meals. Reserve your seat for only $500. Full payment is due April 23, 2018. Convince your boss by downloading and sharing our new PDF that outlines the professional benefits and value biomimicry immersion workshops can add to any organization. Download Convince Your Boss pdf here. The workshop will be held at the New York City Botanical Gardens in the Bronx, conveniently located across the street from the Botanical Garden station on the Metro-North Harlem line, just 20 minutes from Grand Central Terminal in Manhattan. Attendees are responsible for arranging their own accommodations. New York offers endless lodging opportunities. There are several hotels within walking distance of the workshop. The proximity to a station allows participants to easily travel from other parts of the city. Don’t forget about VRBO or Airbnb. Online registration forms must be completed by April 15, 2018. All instructions and pricing information is included within the form. Late registration will be accepted through May 27, 2018 pending availability. Late registrants will incur a $200 late fee. Message to COP21 leaders: Need solutions? Ask nature. Right now, world leaders are gathering in Paris at COP21 with nothing less than the future of our planet at stake. Their goal is to create a new international climate change agreement that limits global warming below 2℃. If temperatures rise above that magic number, the UN predicts that between 20-30 percent of plant and animal species could be wiped out. If things continue as they currently are, we will certainly hit that number (atmospheric CO2 levels recently passed the 400 ppm mark, another measure of the damage we’re doing). We know we cannot allow this to happen. As these leaders work to hammer out plans, they’re going to need to land on solid strategies to limit greenhouse gas emissions and keep our planet’s temperature from rising. Luckily, the solutions are right outside our window. Nature is full of clues for how we can approach our climate change problems, in ways that not only reduce our climate impact, but help us to “…become producers of ecosystem services” (Janine Benyus). 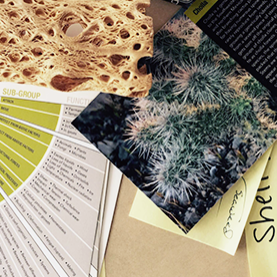 Biomimicry studies and then translates nature’s architecture, design, and engineering strategies to human design. Many of these strategies can apply directly to climate change challenges such as how nature upcycles carbon, harnesses the sun’s power, and creates electricity. COP21 is focused on developing solid action plans and solutions. In that spirit, we want to share just a few of nature’s strategies and corresponding innovations that can lead us down a more life-sustaining path. Our cities are constantly growing and an ever-rising number of people live on a very small fraction of the world’s surface area. By 2050, about 70% of the world’s population is expected to live in urban areas. Half of the population of Asia alone is predicted to live in cities by 2020. Over 60% of the land projected to become urban by 2030 remains yet to be built. Mobility no longer remains an optional luxury for an elite but has transformed into a non-negotiable to participate in society. Consequently, smart mobility solutions are gaining importance. How do we tackle such a challenge of global dimension? How do we serve people’s needs for mobility while simultaneously sacrificing neither biodiversity and environmental values nor human health and well-being? Despite our pride of having invented the wheel (which is, by the way, not entirely true given that the golden wheel spider has been using wheel motion for millions of years before us) humans are not the only species tackling mobility challenges. In fact, mobility is an inherent phenomenon shared by all living systems. Everything alive moves, from cells to organisms to entire ecosystems. Over billions of years, organisms and systems have evolved to be remarkably adaptive to their surroundings with regard to transport, mobility, and logistics.